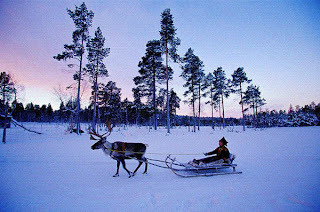 Lapland is a province in Finland which has an area of ​​98 946 km ² and a population of 187,777 people (2002). Rovaniemi is the capital city. This province has a unique phenomenon that is considered beautiful, the sun in the middle of the night. Because of its location on the circumference of the pole, for twenty-four hours in two months each year the province is exposed to the sun all day without stopping. This phenomenon is called the midnight sun or the midnight sun. This phenomenon occurs every June and July. Tourists who visited Lapland to see the unique light of the midnight sun, which does not give the boundary between day and night here. This allows travelers to climb the mountain Lapland in the evening or even a golf exercise for 24 hours. One of the favorite tourist spot for golf tourism in Lapland is Bjorkliden GC, golf courses are located at the northern province. It is located adjacent to the mountainous border of Sweden and Finland as well as Lake Tornestrask. Besides golf at midnight, the other is a popular tourist activity in Lapland is skiing in Riskgransen, which is the most northerly ski resort in Europe. Unlike other ski resort in Europe, Riksgransen do not have the cold temperatures, so the ski lovers need not fear the cold. This is because the phenomenon of the midnight sun before, which makes the sun still shines, making this region remains warm and still have snow for skate skiers. Lapland is also home to the first and largest ice hotel in the world. at this hotel, guests will sleep between chunks of ice that coated sheets made ​​from deerskin. Ranging from candles to chairs and tables, everything in this hotel made ​​of ice. The hotel was built in 1989, in the small village of Jukkasjarvi. This hotel was built by the local ice sculptors from this hotel. Usually the Ice Hotel is only open in winter only. 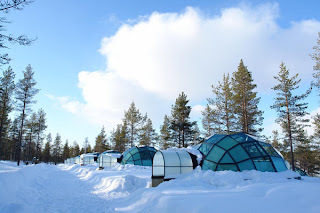 Special for this year, the Ice Hotel is open also in summer. As usual, the water to make blocks of ice come from Torne River, not far from the hotel.